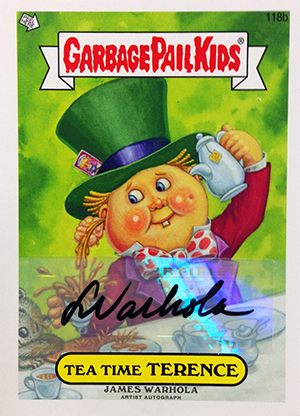 2013 Topps Garbage Pail Kids Mini Cards takes the three GPK Brand-New Series releases and shrinks them down. It also has some new cards as well. The 2013 Topps Garbage Pail Kids Mini Cards base set checklist is huge, checking in at 396 cards: 110 from BNS1, 146 from BNS2, 132 from BNS3 and eight new cards. Black parallels are inserted one per pack. Gold parallels are limited to just ten copies each and fall one per box. The set also has Printing Plates (1:48 packs). Other inserts include randomly inserted Artist Autographs (1:48 packs) and Mini Sketch Cards (1:253 packs). With 24 packs per box and eight cards per pack, it will likely mean at least three boxes to put together the full set once inserts and parallels are accounted for. Combine that with a limited print run and this might be the most challenging Garbage Pail Kids set to complete, at least building by packs. 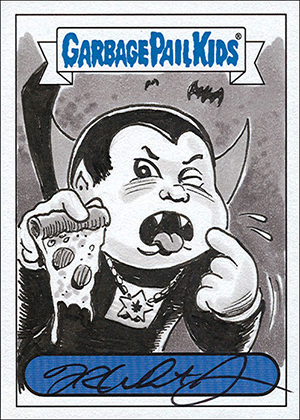 2013 Topps Garbage Pail Kids Mini Cards are available direct from Topps while supplies last. 1985 Garbage Pail Kids Mini UK - Series 1 COMPLETE "B" Set with Wrapper NM! Good: Simple structure, exclusive nature, rare cards in each box. Bad: Too little that’s new, somewhat daunting checklist. The Bottom Line: With its online shop, Topps is experimenting. The mini format worked very well in baseball in 2012. Naturally, that led to expansion. For Garbage Pail Kids completists, there might not be enough new material to justify double-dipping on material that’s so new to begin with. That said, the simple configuration makes for a fun break, even if the names and characters are familiar. 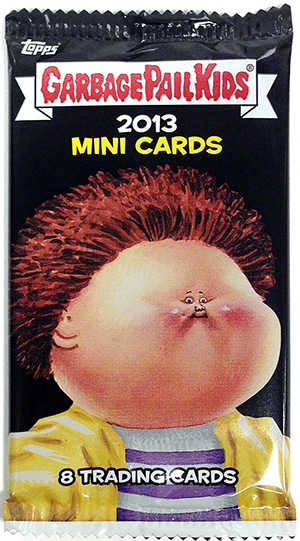 Just as the name suggests, 2013 Garbage Pail Kids Mini Cards are shrunken down versions of the originals. The artwork is fun and just what you’d expect. The backs shouldn’t be ignored as well as they have plenty more gags. Other than the couple of parallels, there aren’t any really different design aspects. The autographs use existing images and sketch cards are just that. Basically, if you’re a fan of what the cards are based on, you should be pleased as there’s no real change. One thing I did find odd is that unlike the originals, these are strictly cards and not stickers. Yet the “Peel Here” arrow remains on the front and the four new images have “Mini Sticker Exclusive” on the back. Perhaps the original plan was to go the traditional sticker route, but it seems a little strange with the final product being a standard card. I love the mini format and the cards are fun. However, they recreate just the most recent sets. For many collectors, they may still be working on their various Brand New Series sets, all of which came out very quickly, one after the next. Add to that, combining all three sets makes this release very big and a little daunting. It could also be considered overkill for those who chased all three sets originally. But for any new collectors or those that skipped them, this would be a fun route to go. I like the concept of offering mini cards and enjoy the exclusivity of the occasional online release but I wish there was more original content. Yes, there are four new pieces for a total of eight cards, but that’s very little when you’re looking at a nearly 400-card checklist. Despite have a straightforward structure, boxes pack a good amount of punch. The promise of a Gold parallel that’s limited to ten copies and either an autograph, sketch card or printing plate make the online price solid, especially if you didn’t collect the sets they’re based on. Be warned, if you’re looking to build the set, it will probably take a minimum of three boxes. Even then it might take a little luck to get everything. Or some trading. That makes a fair bit of overhead to put it together. But if that’s your main focus, turning over the inserts should lessen the blow a fair amount. I love the simple structure this set offers. It’s refreshing to not get a massive stack of inserts. It makes those that are in there more exciting. It also puts a bigger focus on building the set. On the flip side, I have most of what I pulled already, just bigger. Either adding more new content or going back to older sets would help fix this. Or maybe drop the A/B format for the minis and make this the place for the C variations that are starting to appear in all the recent releases. While the artwork may be recycled, this avenue would offer something a little different throughout. Garbage Pail Kids 2013 Mini Cards - Sealed Box (Online Exclusive) - RARE W@W!